The Travelling Art Tent is a new collaborative older people's art project led by artist Stacey Coughlin and volunteers from Arc. 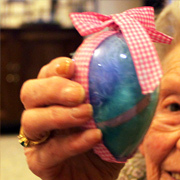 This community project has been working with members of a day centre and residents in residential homes around Stockport and supported using public funding by Arts Council England. Stacey Coughlin runs SAMS-art as a community visual artist, emotional support worker and counsellor working with older people on creative projects to promote well-being, autonomy and artistic expression. She has worked with organisations, residential homes, sheltered accommodation and on mental health wards on a wide variety of projects and artworks for display. 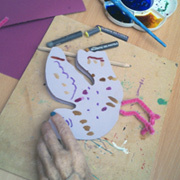 Arc is an arts and health charity based in Reddish, working to promote mental well-being through creative activities. Members from Arc that have progressed onto volunteering for the organisation have assisted on this project in the workshops and curation of the exhibition. This pilot project's theme throughout was 'Floating Away' - the feel of drifting off with your daydreams into a realm of the extra-ordinary and magical! 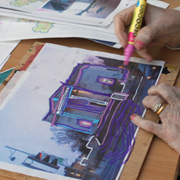 Working with older people in three residential homes in Brinnington, Reddish and Bramhall and an AgeUK Stockport Day Centre in Marple, individual's artwork and ideas have been curated together into an immersive and interactive 'exhibition space' that has toured each of the organisations involved. 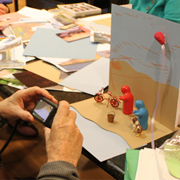 Within each organisation there have been individuals with various physical, sensory and memory impairments and so there have been a variety of approaches, activities and processes to create the different elements of the travelling exhibition. The artwork, photographs, sculptures, written words and textile work were used in the creation of the Travelling Art Tent. The Travelling Art Tent has been made using the art created, as well as providing small interactive activities for 'visitors' to add to in the space. The immersive gallery space has been transforming residential homes for afternoons of magical musings around the theme of 'Floating Away'. The methodology behind this project is exploring the use of temporary altered spaces to engage and connect people through artistic expression. 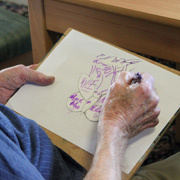 By taking the travelling art gallery to residential homes, residents have the opportunity to see, hear and feel art in their own surroundings; catering for those that might otherwise find gallery visits difficult.